I miss the waterfront. 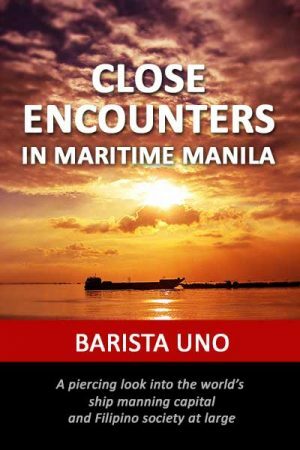 One of my most vivid childhood memories is boarding a ferry with my mother at Manila’s North Harbor terminal. We were bound for Mindanao in the southern Philippines. I remember watching from the upper deck tiny fishes swim alongside the ship whilst it was moored. The riot of smells from ripe pineapples, jute sacks and salt water was an experience I shan’t forget. Much later in life, I would visit various ports as a journalist. The waterfront has an energy, a certain kind of élan which I don’t feel elsewhere. Those days are gone. 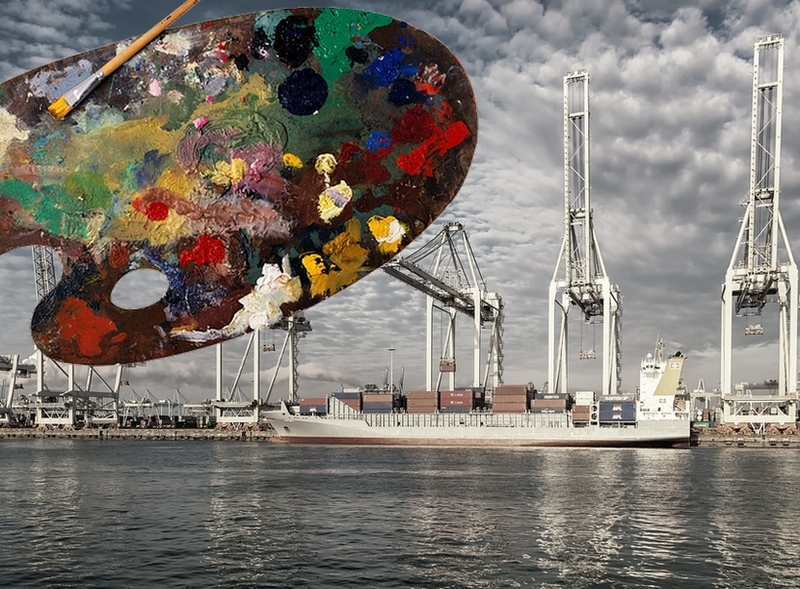 But I hark back to them whenever I see an excellent painting of the waterfront. The following artworks are noteworthy, both for their artistic value and, at least for me, the memories they evoke. 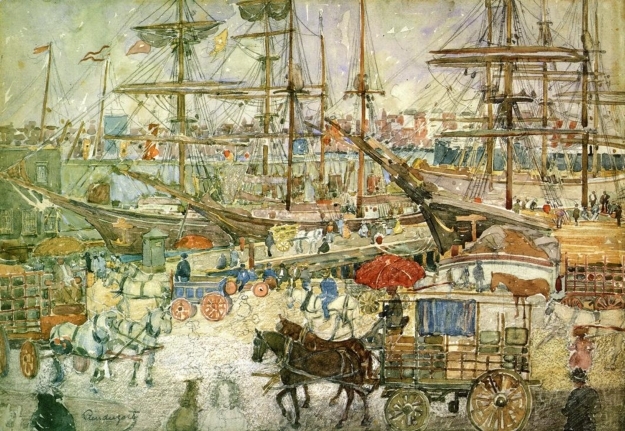 Maurice Prendergast weaves a tapestry of colours to depict East Boston’s vibrant, turn-of-the-century waterfront. 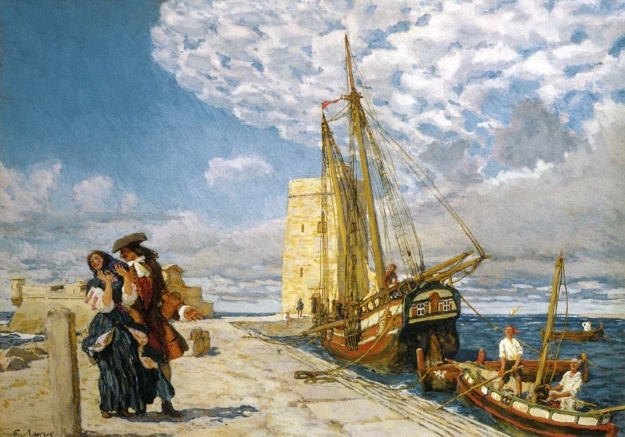 This painting brims with many small details that give the impression of a bustling port. Yet, all the elements are in perfect harmony. The mood is cheerful and carefree, which is achieved in part by Prendergast’s splendid handling of watercolour, his favourite medium. This idyllic painting of a man and a woman walking leisurely on the waterfront is a visual delight. The couple seems too engrossed in each other to notice the two men watching them from the small boat. A sunny day, a gentle breeze, a calm sea — the entire scene is charming, almost pastoral in quality. This sombre painting may well be symbolic of the human condition. The man on the left and the three others standing by the railing are all facing to the right, away from the bright portion of the sky. Their upper bodies lean forward as though they were contemplating an uncertain future. Adding to the gloomy atmosphere is the lighthouse without light at the end of the darkened pier. The waterfront helps define a city’s character, no less so in the case of Venice. In this painting of the stone quayside of Molo, Canaletto shows his eye for detail and mastery of perspective. 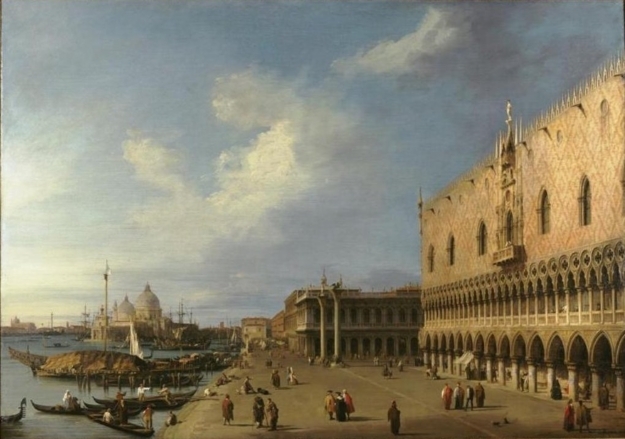 The viewer can imagine the canal on the left and the Palazzo Ducale (Doge’s Palace) on the right forming two imaginary lines which meet at some point in the distance. They frame, as it were, the people in the foreground, creating the illusion that the figures are actually walking to and fro. The whole scene is suffused with a lambent light, which adds to the atmosphere of calm. 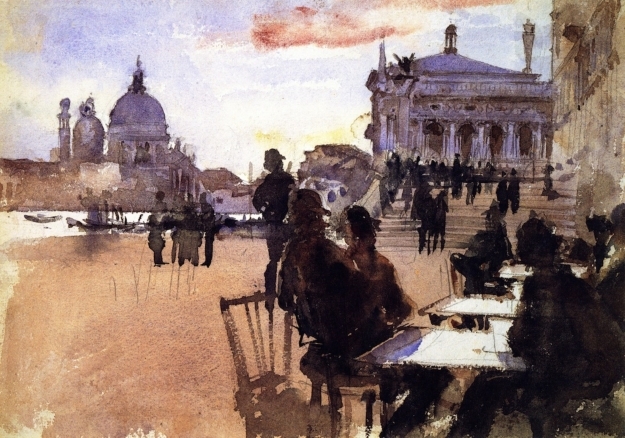 This waterfront and outdoor café scene is set against the unfading beauty of Venice. The human figures are rendered as translucent silhouttes. They appear fluid and do not distract the eye from the gorgeous Venetian skyline. The canal with some small boats forms only a small part of the background. But it is enough to remind the viewer that Venice is a port city. This painting is all about mood. As the sun sets, the people and the boats along the wharf cast long shadows. Smoke gently billows from the smokestacks of steamboats to blend with the clouds. 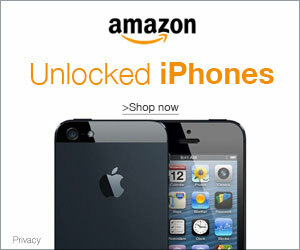 All this creates a laid-back atmosphere, as if to say another day of hard work is done and evening promises rest. 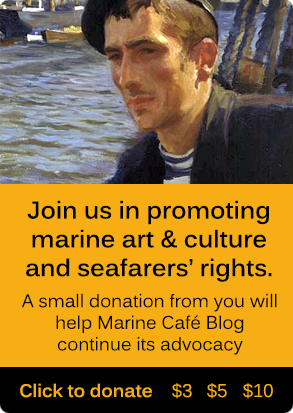 Aivazovsky has been rightly called one of the greatest marine artists in history. 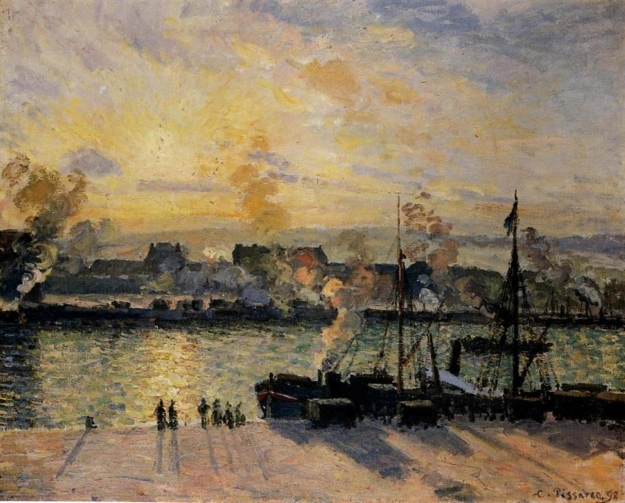 In this painting, a warm morning glow blankets the canvas, transforming the waterfront into a place of sublime beauty. The atmosphere feels otherwordly. 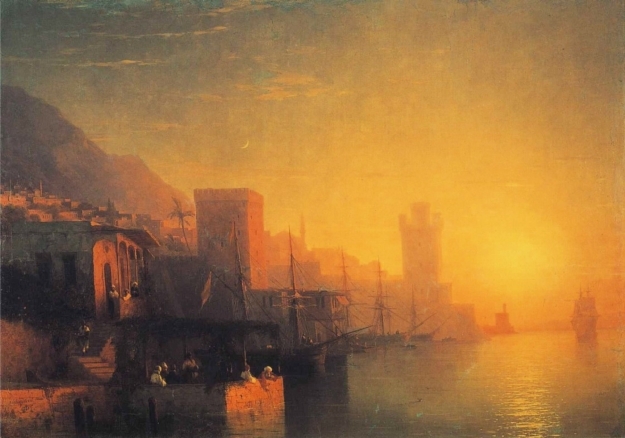 Even so, Aivazovsky has executed the details, including the buildings and the sea water, with admirable realism. This painting crackles with colour. The use of short, quick brushstrokes is typical of Impressionist art. However, the artist seems to have been careful not to deconstruct reality too much. 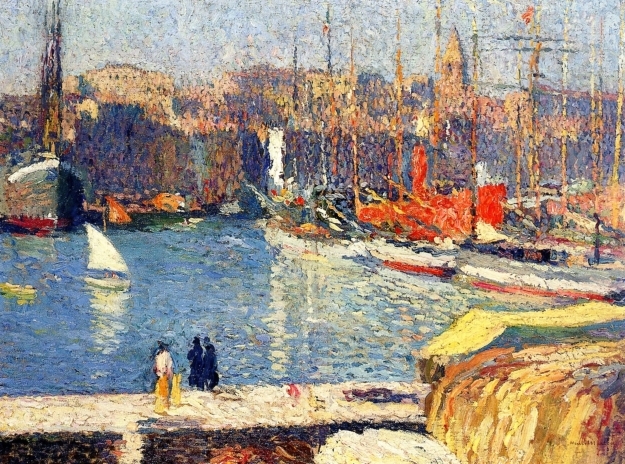 The shapes of the boats as well as the buildings in the background are distinct — even as the colours are rendered in separate patches that optically blend with one another. The overall visual impact is undeniable. Twilight dims the boundary between estuary and town in this spellbinding artwork. The masts of the tallships and the woman beside the lamp post stand like sentinels. It is as if a photographer had frozen the action. 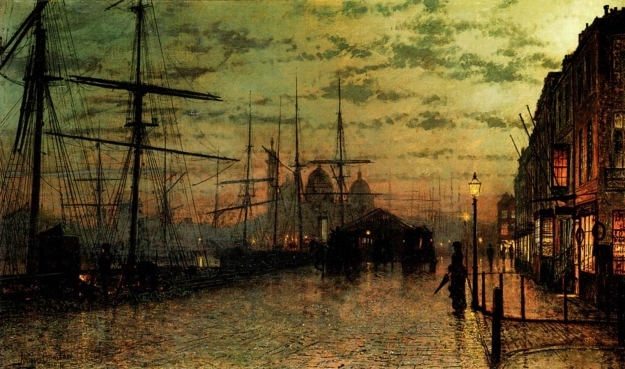 Indeed, John Atkinson Grimshaw’s realistic style is almost photographic. Note the little puddles of rainwater on the street and sidewalk. 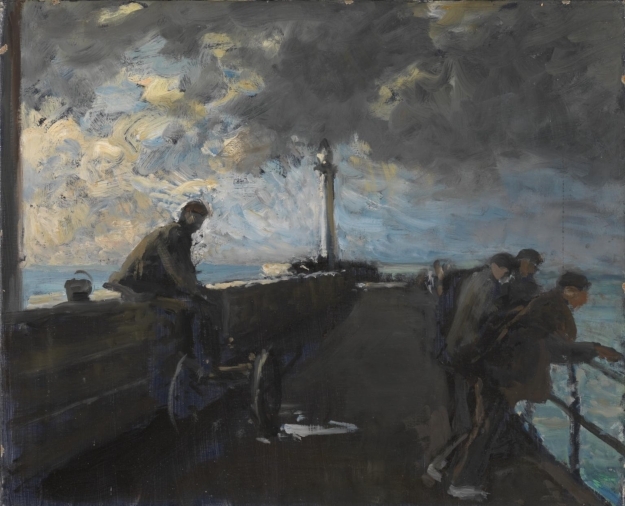 The artist’s impeccable rendition of light from different sources gives the viewer a sense that the waterfront, despite the approach of night, is alive. 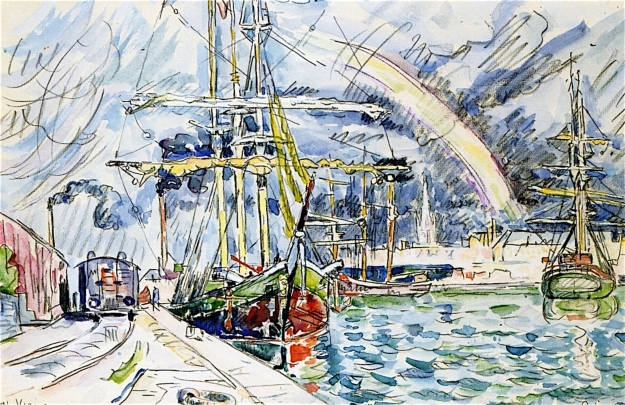 This piece is quite refreshing if only because it is not in the style of Pointillism, for which Paul Signac is better known. It looks like a doodle, a study for some ‘serious’ oil painting. Despite the playfulness and abandon, the artist shows his artistic dexterity and control and his familiarity with ports and sailing ships. Feel free to comment on this article. All those paintings are wonderful! They touch my soul deeply. I couldn’t choose the one I like best…Love all of them! It’s good to feel that I made the right choices. Thanks very much, Maria Alice. Excellent, thanks for posting. I’ve approached and departed many ports on many boats and ships; never feel more alive than in those moments. 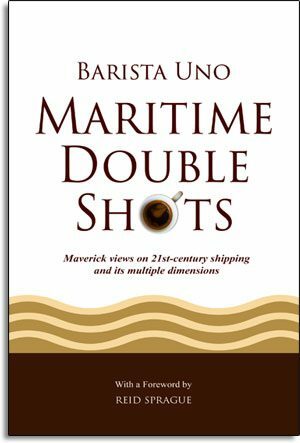 Many thanks and compliments, dear friend Barista Uno, for this delightful text and the wonderful paintings. You write very well and it’s a great pleasure to read your posts! Thanks for visiting the blog and taking time to comment, Celeste.